The Machine has been created by students at the Center for Computer Research in Music and Acoustics (CCRMA) at Stanford University, as part of the course M223 - sound, structure and machines - in Spring 2013. The course was held by Robert Henke, Mohr Visiting Artist 2013. 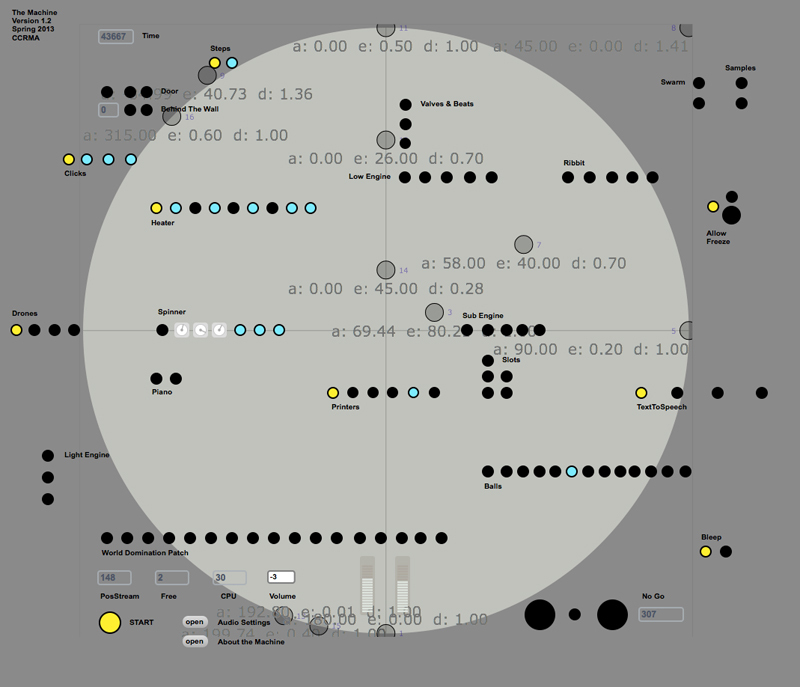 The Machine is an algorithmic and stochastic computer program which creates a constantly varying stream of audio events, forming some sort of abstract industrial soundscape. The original version has been constructed to work in a half dome ambisonics environment and with a Yamaha Disklavier. It had its premiere at the Stanford University Bing Concert Hall Studio on May 28 2013. This version is scaled down to stereo and the piano is replaced by samples. Alex Hay, Myles Borins, Kurt James Werner, Mayank Sanganeria, Gina Collecchia, Tim O'Brien, Thomas Walther, Luke Dahl, Holly Herndon, Caleb Rau, Dan Somen, Pablo Castellanos Macin, Wiley Webb, Charlie Forkish, Lauchlan Casey. Special credit to Carr Wilkerson and Fernando Lopez-Lezcano for making the concert / public presentation happen and to John Chowning and everyone else at CCRMA for enthusiasm and support. Special credit also to Dave Kerr for documentation and coffee and to Chris Chafe for making sure CCRMA is a place that allows nerds to explore strange ideas and geniuses to work on the future, or vice versa or both.